A new report surfaced about some major restructuring occurring over at Warner Bros. after Justice League failed to live up to its expectations. Within that report, it was revealed that Ben Affleck will stay on board to play Bruce Wayne again, but not in Matt Reeves' The Batman. Instead, it has been reported that he will stay on for the still in development Flashpoint movie. Apparently, Warner Bros. has been extremely happy over the way that The Flash has been received in Justice League and the Flashpoint movie will remain in development and will more than likely be the last time that we see Ben Affleck as the Caped Crusader. The Flashpoint story in the comics shakes up the way that DC Comics was perceived and is more than likely going to do the same thing for the DCEU, which has been rumored since July when the movie was announced. In the Flashpoint story line, the Flash wakes up to discover that everything around him has changed. His mother who had previously passed away in his own timeline is alive and his dad died 3 years earlier due to a heart attack as opposed to dying in prison. There is no Justice League and there are some huge changes for the Batman story. Bruce Wayne is murdered instead of his parents, which leaves Thomas Wayne to later turn into Batman while his Martha Wayne goes insane and turns into the Joker. With this storyline, it seems obvious that Ben Affleck would only have a small part unless they decide to break up the story of Flashpoint into chunks, but that seems unlikely. The point being, there isn't much room for Bruce Wayne, since he gets killed off. 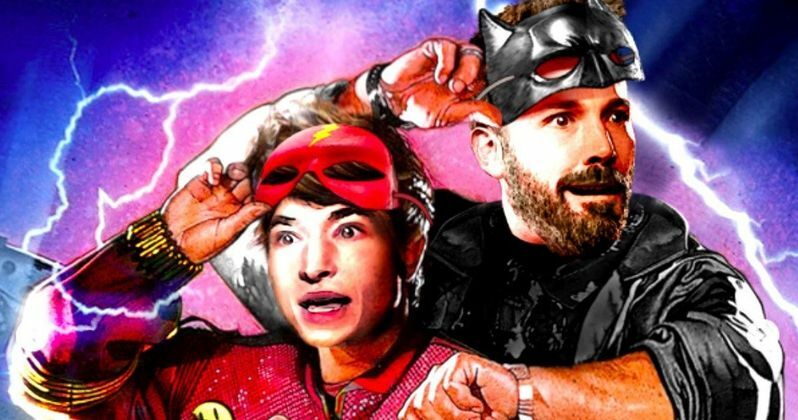 It would all depend on how much time that the movie devotes to Barry Allen's current timeline as opposed to the altered timeline, which will have a new Batman, heavily rumored to be Jeffrey Dean Morgan who portrayed Thomas Wayne in Batman v Superman. This leads us back to Matt Reeves' The Batman, which will presumably not have Ben Affleck in it at all. Affleck was originally slated to helm the project, write, and star in it, but over the last year, each component has been taken over by Matt Reeves. The new Variety report confirms that Affleck will not return and that the director has already been talking to others to take over. Jake Gyllenhaal's name has come up frequently and now Jon Hamm's name has been thrown around as well, which fans have lobbied for in the recent past. If the Variety report is to be taken seriously, it appears that Warner Bros. will be significantly retooling the DCEU and the Flashpoint movie might be just the reset button that the studio needs. It has long been rumored that the fate of the DCEU rested on the success of Justice League and it looks like there was more than just an element of truth to those initial rumblings. You can read more about Ben Affleck playing the Dark Knight one more time in the Flashpoint movie via Variety.